Digital transformation is poised to bring a thorough shake-up in the accounting industry. Companies are under increasing pressure to deliver on the latest innovations. Most industries are slow and skeptical at adopting radical methods, and this is true for the accounting industry as well. Accountants need to be prepared for the transformation and threats to competitive advantage as there is a disruptive digital transformation in progress. 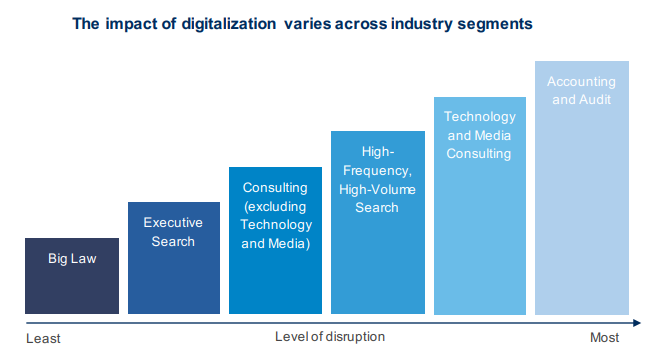 The graph below illustrates the impact of digitalization on different industries, accounting being the most impacted one. In the recent years, accounting companies have been involved in the digital transformation that is taking place, and effective strategies are being implemented by them. However, there are still many challenges ahead. Bookkeepers and accountants are becoming redundant with the on-set of automation and AI. While it may not seem like a positive thing, it helps companies to reduce overheads and deploy the workforce in other operations. These human resources can be helpful in delivering the tasks that can’t be left for the automation, such as research, deployment of automation, and testing. Automation has made it possible to record transactions automatically. And with the number of tools available, they can also be automatically analyzed. In short-term, this is disruption, but in the long-term, this is a positive thing. Automation frees up time for what matters – advice the client. People are now doing all their accounting tasks on their own and rarely looking for an accountant unless it is a complicated issue. Firms are going to see fewer clients and walk-ins. Firms counting on individual tax returns or individual counseling are going to be the hardest hit. It can somewhat be mitigated by the fact that accounting firms can reduce their number of employees. However, companies who want to remain competitive need to be more determined with procuring clientele and should start providing more accurate services like business management and portfolio analysis. Accounting firms are abandoning traditional methods in favor of accessible and more scalable solutions. The restrictions of old technologies are driving digital transformation efforts in no small part. While it is essential to add new skills, but so is upgrading to an easily accessible system. Digital-savvy accountants are aware of the fact that best technologies make accounting processes easier and better, which relieves IT headaches instead of creating them. Consider a solution like QuickBooks desktop hosting. It makes accounting more accessible and makes it easier for the team to collaborate, even from different geographic locations. Finally, with the cloud technology, it takes minimal maintenance and management. Most accounting firms have adopted technology at each new wave of tech developments. Each department may use a different system for management, analytics, and other accounting tools. But this causes complexity. Many systems are layered on top of each other which decreases productivity. It can be difficult for employees or clients to keep track of all systems. To overcome this challenge, companies must find ways to streamline and simplify their accounting processes. It doesn’t necessarily mean to get rid of your existing system, but it implies keeping the systems together. Another challenge to digital transformation in the accounting sector is keeping up with the latest technologies, and on the other hand, to keep up with various transformations happening internally. New challenges faced by the companies are in Artificial Intelligence, Internet of Things and Machine Learning: how can they leverage them? The key is to stay one step ahead. Anticipate these technologies by creating new roles where technology complements human tasks instead of replacing them. Tools should develop a way to engage people and push collaboration with technology further. Digital transformation in the accounting sector isn’t just about automating every process and make accountants robotic. Instead, it is about enhancing accounting with smart data, enable strategic decision-making, improve reposting and eliminate tedious workflow. It is only possible if the technology is used in the right way.